Between the years 1499 and 1533, the city of Cre­mona, devastated by continual wars, had changed rulers six times. In the midst of such tumults (to which one could add in­ternal discords, poverty, and misery), cor­ruption of morals had made rapid and appalling progress. The churches were abandoned and profaned, the use of the sacraments neglected, gross errors com­bined with superstitions of every kind universally prevailed, and vice reigned in all classes of society. The sacred pas­tors either stood aloof from their flocks or kept silent with regard to this state of things. Such was the sad spectacle that the city, formerly evan­gelized with so much zeal by St. Omo­bono, now presented to the world. Invested with the sublime power of the priesthood, Anthony Mary forgetting all that he had done up to this time, decided to work with new and increased energy to repair such ruin. To base his reform on a solid footing, he first had to remove the cause of evil. 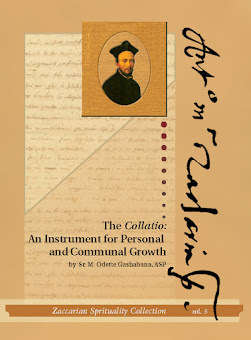 So he devoted himself en­tirely to rooting out the errors and prejudices, honoring the practices of piety and the use of the sacraments and thus, once more, reviving the faith. He continued to hold conferences on Sundays and holidays for the young noblemen of Cremona in the Church of St. Vitalis. He taught catechism to child­ren and other uninstructed persons and spent much of his time among those who were so dear to him, the poor. He vi­sited them in the hospitals and prisons where he was looked on as an Angel of Consolation and was beloved by all. His house was always open to the poor and pilgrims and to all who wished to consult him either for advice or direction or for comfort in their afflictions. From this, an incredible amount of good followed, not only for the poor but persons of every rank. Citizens and foreigners flocked to him at­tracted by the fame of his sanctity. His sweet and gentle manner and his affa­bility won the hearts of all who approached him. It was his preaching above all that showed his power as a reformer. 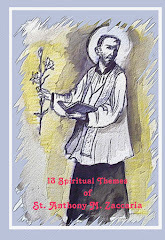 His words were inspired by his inward charity and meditation on the eternal truths. He was diligent in the study of the Sacred Scriptures and writings of the early Fathers, especially the Epistles of St. Paul. It was from these that he drew his deep and triumphant eloquence. 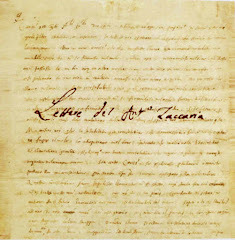 When he spoke of the deformity of vice, the beauty of virtue, the necessity of penance, or the obligation of loving God, the words flowed from his lips in fascinating eloquence. He put all before his listeners with such warmth, and at the same time with such clearness and grace that it seemed, it was not a man but an angel who spoke; such, in fact, was he called by those who went to hear him, saying to each other: "Let us go and hear the angel." Men, women, nobles, working-class, and even many of the clergy assembled in vast crowds, eager to listen to the words that fell from his lips. After hearing him, they longed to go to him for advice and help in spiritual af­fairs, and to open their hearts to him. Anthony Mary made himself available to all, instructing them in private conferences and attending to them diligently in the confessional. Sinners, who up to this time had lived in vice, now repenting of their bad lives, ran to his feet deploring and weeping over their sins. Many, who a short time before, had been indifferent to the practices of piety, now gave them­selves up to fer­vent prayer and the frequent reception of the sacraments. Many, burning with a desire of giving themselves altogether to God, either renounced the world to retire into the sacred cloisters or led humble and peni­tent lives, occu­pied entirely on works of mercy. And of other pious associations. Restorer of the service of God. of the ardent charity of the Holy Ghost. Today a citizen of heaven. for his saintly life and heroic deeds. Cremona was not to be the only city to enjoy the fruits of the charity and zeal of Anthony. A much wider field, was the beautiful and populous city of Milan, which of all the cities in Lombardy, was the most corrupt. The time had arrived for Anthony Mary to begin his labors in this new field. Some unforeseen circumstance brought him to Milan in 1530, and he took up his abode near the church of St. Ambrose. He was filled with horror at the sight of the evils then prevailing. The habits of sin were deeply rooted, and there was a complete forgetfulness of spiritual things. It seemed to Anthony that it would require, not a man, but an angel of power and wisdom to root out these evils and bring the people back to the love and service of God. But he did not lose heart. He wept and prayed, and disciplined himself by flagellation, and then fixing his eyes on Jesus Crucified, he said confi­dently: "Of myself I can do nothing, but this crucifix will give me the victory." And he set himself to work. Here, he did all that he had done in Cremona, preach­ing, catechizing children and unin­structed persons, as well as visiting the sick in the hospitals. He soon realized that to cultivate a soil so long trodden down, so choked with thorns and briars, and bring it to a state of perfection would require more laborers and an entirely new plan of action. Where to turn for these laborers he knew not, for the priests were for the most part like the people, intent only on the things of this world, and were, moreover, ignorant and ambitious. It was then that he thought of forming a body of clergy according to the spirit of St. Paul, whose zeal they should imitate. From this, ori­ginated the Congregation of Clerics Re­gular of St. Paul, afterwards nicknamed the Barnabites. The plan of work was conceived by him in a moment. A magnificent program! The hospitals, families, prisons, churches, public streets and squares were to become the field of action. 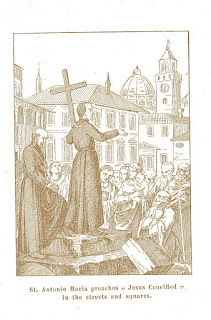 For the people, cold and indifferent, would not come to hear the word of God, so, in order to preach to them, he took a crucifix and with this in hand advanced into the streets and squares in penitential clothing to preach the holy reform. To see and to hear him were enough, his eyes shining, his face lit up, every movement, eve­ry gesture, his whole frame thrilling. Most striking of all were his inspired words which clearly showed that it was the spirit of God that spoke and worked in him. Who is it who cannot see in this new apostle the image of St. Paul who, to bring souls to God, is ready for anything— contempt, ignominy, torments, and even death itself?